The parachutist who dressed as the Queen for the London 2012 Olympics jumped from a helicopter and parachuted in. There was air displays from a stunt plane and the two-seater Spitfire flown by Carolyn Grace. Lots and lots of traction engines, steam wagons and cars! A full-size train was running throughout the day. There was a fun fair section with dodgems, wheel etc. A live band playing throughout the whole day. 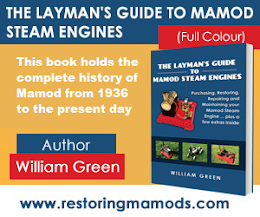 Also, for an update on the RestoringMamods.com book, I have currently completed around 60% of the book...it will be published soon!